FRESH 12 pack 12oz cans Mountain Dew Throwback with SUGAR, not high fructose corn syrup (HFCS)!!! Great collector’s item too!!! 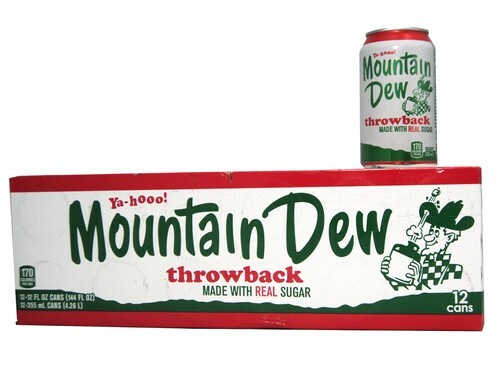 The folks at Pepsi made the design and ingredients better in their second Dew Throwback version. They went back to the beginning of Mountain Dew and brought back the famous Hillbilly complete with the cork shooting off the jug and the Hillbilly saying "Ya-hooo"!! The only thing they did not include was the old tagline "It'll tickle yore innards". I wish I knew why it was not included. The other thing Pepsi got right this time was including Orange Juice in the formulation!! The first version of the Dew Throwback did not contain OJ and left many Dew purists upset. Dew drinkers around the world celebrate the inclusion of the OJ!! For you youngsters out there, there is a very clear taste difference between sodas sweetened with sugar vs HFCS. They also go down smoother too. ENJOY A STEP BACK IN TIME WITH A MOUNTAIN DEW WITH SUGAR MADE WITH AMERICAN PRIDE!! !